Mother, do not ignore the odor that comes from the ear of Little, because baby ear smell can be a symptom of ear infection, you know! But do not worry, Mother can do maintenance at home to overcome them. Basically, earwax is the body's natural way of protecting the ear from the entry of germs, and foreign objects such as dust that potentially infect the eardrum. Another case if the baby's ears smell and accompanied by white or yellowish liquid, it becomes a sign that the ear of Little Infected. The main cause of a smelly ear is a middle ear infection ( otitis media ). This condition occurs because of inflammation in the middle ear which causes fluid buildup behind the eardrum and then become infected. These ear infections can be caused by bacteria or viruses. This indicates a small hole in the eardrum. But do not worry, the discharge will stop once the infection is treated. This is because ear infections make chewing and swallowing becomes sick. Position lying makes ear infections more painful, so the baby becomes difficult to sleep. Like infectious diseases in general, ear infections in infants and children can also cause fever. Fever is an immune response to fight infection. 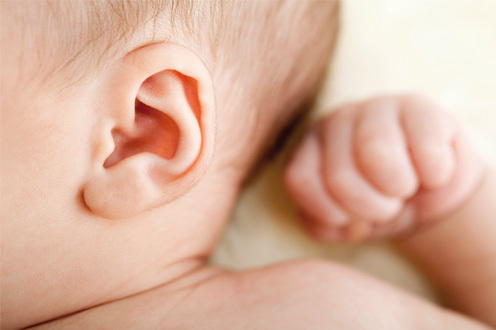 The baby's ear smell due to bacterial infection can be overcome by prescribing antibiotics as prescribed by a doctor. Your doctor will prescribe antibiotics for 7 to 10 days. If Little Person has a fever and feels pain in his ears, then the doctor will prescribe painkillers and fever relievers such as paracetamol, and ear drops. Use of antibiotics should be carefully and as recommended by physicians, this is to prevent the development of bacteria that can become resistant to antibiotics. Sometimes, ear infections do not require any treatment and can heal by itself. However, if there is no improvement after two to three days, call your doctor again. Compress Try to warmly compress the ear of Little One for about 10 to 15 minutes. This can help reduce pain. Keep the Little One to stay hydrated by giving it enough fluid intake. Because swallowing can help open the eustachian tract so that trapped fluid can flow. Put two pillows under the mattress to fix the sinus drying. Do not put a pillow directly under the baby's head. Provide breast milk for at least 6-12 months. The antibodies present in breast milk will protect the baby from ear infections. Keep the Little from exposure to secondhand smoke. Exposure to cigarette smoke can make ear infections more severe. Also, make sure the Little Person has received complete immunization. Additional flu vaccines and pneumococcal vaccines are also good for preventing infant diseases. Infants and children are more susceptible to ear infections because they have their eustachian channels smaller and more easily clogged. As the child grows into adulthood, the channel becomes larger so the fluid can be drained more easily. Immediately see a doctor if, after three days of treatment, the baby's ear smell does not also heal and there is no improvement in symptoms. Especially if the Little remains fever and accompanied by the release of blood or pus from the ear.